The 870-MPC-AB1200 boasts a robust 10 Learning Activity Packets (LAPs). The first two LAPs concentrate on skills core to all stations: an introduction to mechatronics design, systems concepts, safety, machine operation, sensors, pneumatic pick & place, and electrical pick & place. Integration skills across multiple stations as well as skills specific to an individual station are covered in the balance. Overall system skills include discrete I/O handshaking, system start-up/halt, system stop/reset, and FMS programming. All mechatronics stations teach operation, sequencing and programming skills. Stations can be easily moved apart to function as individual workstations by releasing two quick connects and one plug-in cable. Stations can also be mixed and matched, enabling instructors to build and change the system as budgets allow or needs change. 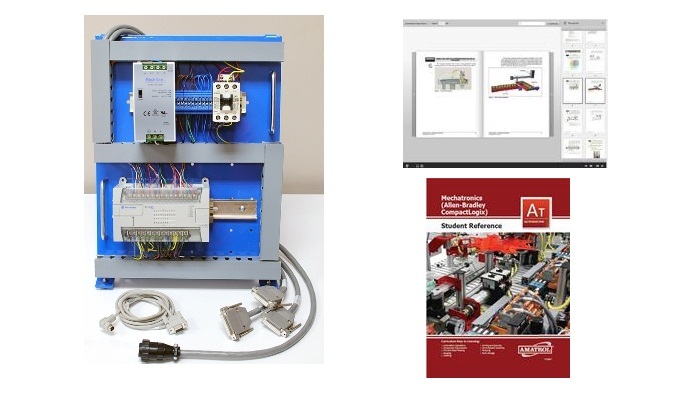 Many mechatronics station combinations are available to support your needs. The 870-MPC-AB1200 includes the Allen-Bradley AB1200 Programmable Controller, a PLC Portable Mounting Console, 24 VDC Power Supply, Master Control Relay, a Student Learning Activity Packet Set, a Teacher’s Assessment Guide and an Installation Guide.